Pig in a roof vent with branch suspiciously nearby. There is a National Geographic-quality wildlife mystery that's been playing out in my side yard over the course of months now. My Facebook readers are well aware of this, but it occurred to me that those who read my blog or my Deck of 1000 Spreads page are not yet initiated. It all began this past fall as I noticed something odd sticking out of the roof vent of my home. I ignored it for a while, because anything that even hints of needing intervention or repair is routinely ignored in my home. But finally curiosity got the better of me and I saw that one of my dogs' stuffed animals was shoved into the roof vent with only its head sticking out. So a photo session ensued, followed by a lively Facebook discussion, and then I went back to ignoring it. A few weeks later, I noticed the pig was gone and the nest it was part of had been disassembled and cast to the ground. 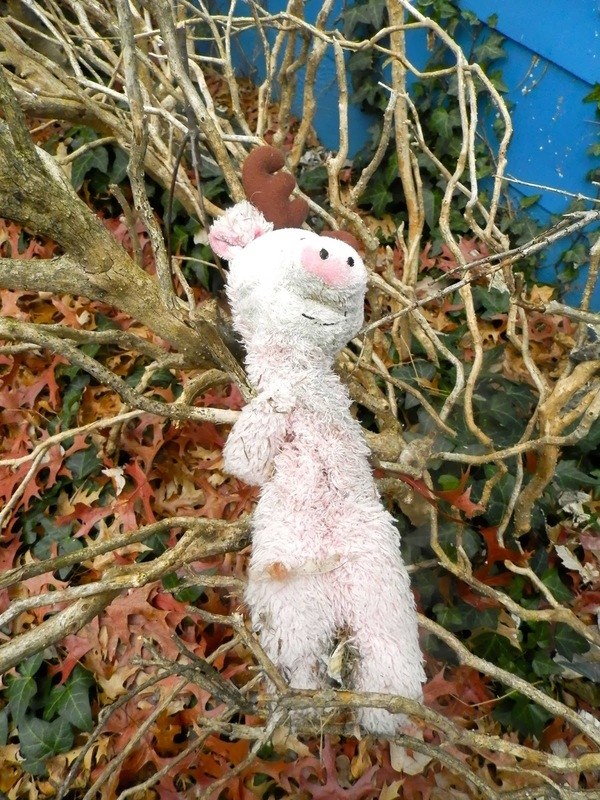 So I did another photo shoot and left the pig where it landed, on some dead branches I have been ignoring for years. It stayed that way until a recent snowstorm took the pig to the ground. Or so I assumed. But a couple of days ago I saw it back up on the branches again. 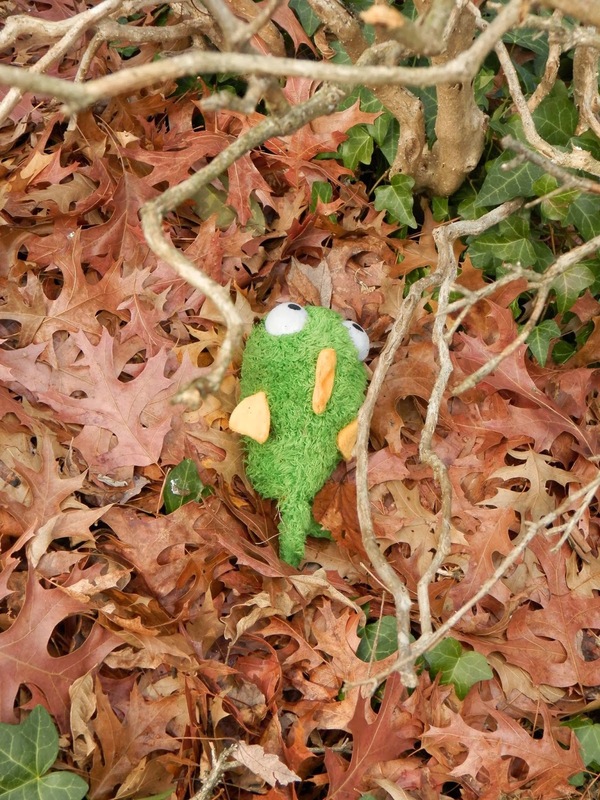 Not only that, but it had been joined by another stuffed toy, Blub Blub. Pig, after being cast out of the roof vent. Now, these toys usually live in my back yard. To get to the roof vent, the toys would have had to have scaled the fence and climbed forward and upward along the side of my house to the vent, which is located in my front yard. There is a tree whose limbs reach the roof vent. That tree is also in my back yard. So it's possible the toys might have climbed the tree then, balancing precariously on the furthest branches, reached the roof vent. 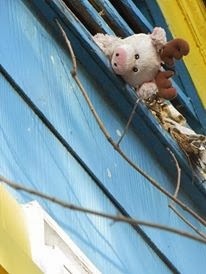 Alternately, the toys might have had the help of birds or squirrels getting up to the vent. And therein lies the mystery. Popular opinion has it pinned on a squirrel, but because all the toys in their many moves have been found directly beneath the vent, I'm thinking birds. A squirrel has the opportunity to drop the toy anywhere between the tree trunk in the back yard and the roof vent in the front yard, yet the toys are always found beneath the roof vent. The plot thickens as Blub Blub appears beneath the vent. It occurs to me that the stuffed animals make the birds or squirrels feel safer at night. After all, the toys stink of slobber from endless rounds of fisticuffs between my dogs. Who's going to raid a nest that smells like dog? But they're also soft and fluffy and warm and probably help keep things dry. When I think of it like that, it all makes sense. We all want to be safe and warm and dry. I imagine this saga will continue over the coming weeks as the birds/squirrels try and try again to get these relatively huge toys up into their nest. I'm keeping an eye out to see if I can catch anything in action. But the one thing this whole drama has taught me is that, beneath our noses every single day, there is something fascinating and dramatic happening in the animal kingdom. And we so rarely even notice the critters around us, much less catch them doing nefarious deeds. So while today's post was purely for fun, it makes you wonder about all the stuff you don't see that's going on out there. We all have our lives to live and the things we covet. Even if we're birds.